"One of the more fortunate aspects of the New Britain campaign was the creation of a light air force within the 1st Marine Division two-and-one-half months before D-Day. No one could foresee the type of terrain that would be found, the extensive patrolling required, or that the division would have to spread itself over an area 110 miles long. The proposal for an air liaison unit seemed a good one at the time, but the pilots and their tiny Piper Cub planes proved it substantially more than just a good idea. 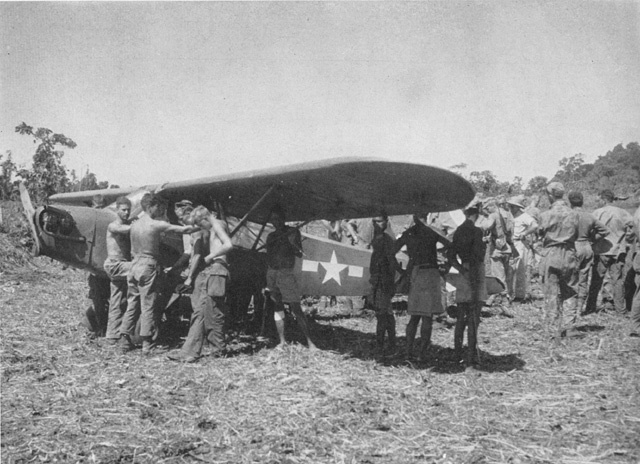 The composition of the Cape Gloucester Air Force (the unit's unofficial designation)2 was typical of the Old Breed. Its pilots wore no wings, carried no flight orders, received no flight pay and were not designated Naval Aviators. The one officer and 11 enlisted men who comprised the pilots and observers of the aerial unit were merely infantrymen and artillerymen on leave from their organizations. But they flew eight to ten hours daily in New Britain, weather permitting, and logged well over 1,000 hours in the air. The all-essential ground crews were men who might or might not have worked with planes previously, only one having had any extensive experience with Piper Cubs. Initially the idea of a light air force within the division was for artillery spotting and Captain T. A. Petras, aide and pilot to Major General A. A. Vandegrift, together with Lieutenant Colonel Kenneth H. Weir, Division Air Officer, suggested such a unit to his superior in the early summer of 1943. The division commander was favorably impressed, while Brigadier General W. H. Rupertus, then ADC, was of the same mind, having recently witnessed Army air-ground maneuvers." THE CAPE GLOUCESTER AIR FORCE utilized the Talasea airstrip. "2. Because the German Air Force and its deadly Messerschmidts were much in the news at the time, the division affectionately dubbed the unit its "Luftwaffe," the little planes "Messercubs" and "Piperschmidts."" 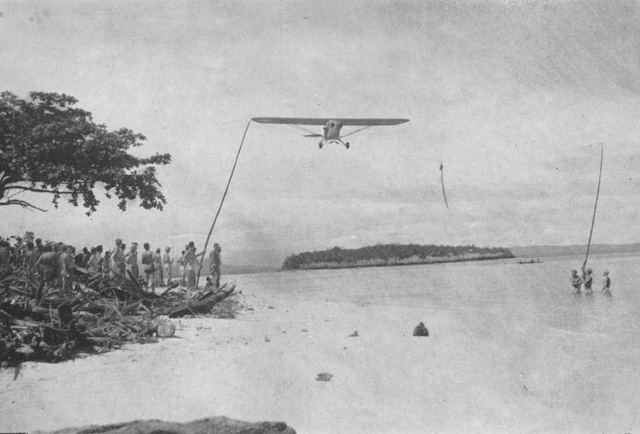 THE METHOD USED AT CAPE GLOUCESTER to effect a message pickup by air. This photograph was made later in the year at Pavuvu.